In this article I wanted to talk about the possible Jewish roots of spanish flamenco music. Olééé! “Although not everybody finds Jewish overtones in the rhythmic dancing, the moaning style of songs, and the lush, sophisticated guitar playing,” esteem many music experts, “many believe that flamenco is closely connected to Sephardic schul music with its eastern influences and hidden tendancy of melancoly…. Flamenco in Spanish has two meanings, “Flemish” and “flamingo.” Most likely these are related. The Spanish had close contact with the Flemings, because Flanders, the Dutch-speaking area of what today is Belgium, was occupied by Spanish for nearly three hundred years until the French Revolution. Even earlier than that, however, flamenco in Spanish had taken on the sense of red-ckeeked or pale-skinned, the Flemings, like other northic nations, being lighter-complexioned than the generally darker southern nations like Spaniards. And because a reddish pink is the color of the flamingo’s under-wings, which appear for a short instant fabulously when the bird takes off and flies, it came to be called flamenco too. 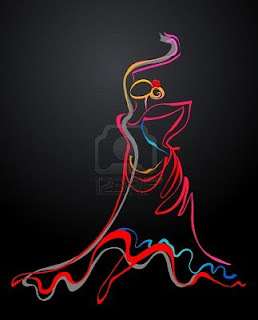 Actually, as music experts have observed, flamenco is not so much related to Sephardic synagogue music as it is to Ashkenazi synagogue music, and specifically, to the chazanut or high cantorial style of Eastern Europe, whose technic can sometimes remind flamenco singing. Does anybody know a chazzan to compose a songful melody for our Jewish Toledo Tour web page::))?? Not that close parallels to flamenco can’t be found in Sephardic music, too. There are Sephardic songs or romançeros, such as the well-known one called “La Petenera,” with its line “Dónde vas bella judía?” (“Where are you going beautiful jewish girl?”), that have cante jondo constituents. The fact that such a song was taken with them in their wanderings by Jewish exiles from Spain in 1492 indicates that it belongs to the earliest period of flamenco singing, whose known history does not go back much further. Whether or not, as some experts have discussed, they go all the way back to the singing of the Levites in the Beth Ha Mikdash, or simply share a single eastern Mediterranean source with Arabic music, whose influence on flamenco was enormous too. Please contact us to learn more about our private walking Jewish Toledo Tours with shomer mitzvot jewish guide. www.jewishtoledotour.com thanks you for reading us.